Well, there you go. Quick and easy blog post. 2013. Six. As you might have guessed, my game room studio, which was so nice and neat has become victim to a flash of sewing creativity. I hope I sew all I brought up before I lose the inspiration. Off to cut some more! Make Room For Amaryllisus, erm, Amarylli, Amaryllises? The bulbs. I just have to get this post out of the way. Stupid thing has been taking up valuable thinking space in my brain, and lately that space seems to be at a premium. So, despite crappy photos I'm gonna share the start of my Amaryllis winter. I'm traditionally reminded to plant my Amaryllis bulbs each Thanksgiving when my mom gifts me with a pre-planted and already growing plant. Here's the deal there. My mom could put any plant in a mixture of sand and coal dust and it would grow. It is like some magic connection she has with the world of roots and photosynthesis and I didn't inherit it. Every Thanksgiving she shows up with a healthy plant that stands a pretty good chance of death before blooming in my hands, but unbelievably I make a commitment to it and sometimes I get beautiful flowers out of it. This year I not only got beautiful flowers, the first bud stalk bloomed exactly on Christmas Day(! )(what are the chances?!) and that stalk had six blooms. The second stalk followed shortly after with four blooms. A raging success around here. Over the last few years I have added more bulb planting to my winters and because my mom didn't touch them with her magic hands I have had mixed results. The idea of a house filled with blooming plants throughout the winter encourages me and I keep on trying. I purchased another bulb and planted it a week or so after Thanksgiving and that one took a looong time to do anything. I have my guesses as to why it took so long to sprout, but after the long wait it finally began to grow and is providing two bud stalks, the first will bloom tomorrow or the next day and seems to have five blooms, I can't wait to see what the second comes up with. So far the Amaryllis 2010 project seems to be going smoothly. And beautifully, I might add. Gillian and I stopped by a Target on the way to the bus back to NYC on the Sunday after Christmas (so sad, too soon) to get a movie for her ride when we came across this display, the plants being marked something like 75% off. Clearly the Amaryllis is a plant that wants to grow. Usually it takes water, dirt, warmth and light to get it going, but warmth seemed to be enough for these poor, persevering souls. 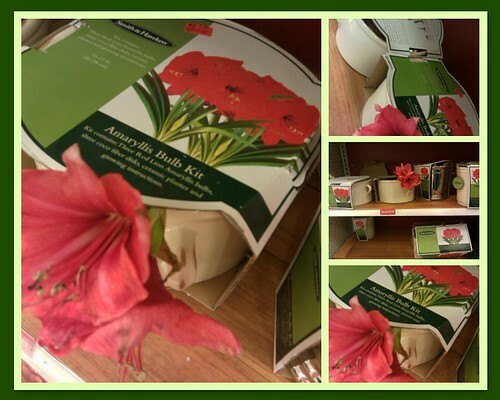 If you haven't purchased Amaryllis bulbs before, there is a range of product out there. You can get just the bulb and add the peat and container yourself or you can purchase them with containers and planting mixture. Usually the planters you find are cheap-o plastic things, but Target had some pretty nifty clay pots and at the price they were being offered, Gillian and I went to town. We must have looked like crazy ladies, opening every box to find bulbs that had resisted sprouting and combining them with pots we liked. Gillian got two single pots (one for work and one for home) and I got the triple pot, pulling bulbs from other boxes to get a good mix. Who knew what we would get out of them, but for the price (really cheap! ), it was worth the chance taking. The next morning I soaked my three planting disks in water and planted my three bulbs. Turns out I only needed two to fill my planter and was left with a bowl full of dirt. That I just couldn't throw away. Luckily I had a mouse in the house which sent me to Home Depot where they had loose bulbs on sale (again really cheap and most of them sprouting away), and I bought one and stuck it in a bowl with my extra potting soil. It is Amaryllis Central around here people. And even without my mom's magic touch I have some plants a-blooming. Of the three I purchased at Target one has no foliage, but one bud stalk that bloomed today and has six flowers coming in! One has some foliage and one bud stalk that is growing very slowly and the third has only foliage so far. I have hope. This photo was taken the other day, pre-full bloom. The bulb in the fore has one stalk coming up and the one behind is the one that is, so far, foliage only. *It seems that the plural of Amaryllis is Amaryllis, something about genus names and blah, blah. Go read this article to get the rest of the story. 2010. Sixteen. I love how these photos make my home look like a little green house, all homey and home to plants that are thriving. I always think that a home with plants is a home where things are nurtured and taken care of, a nice feeling to get. And a nice deception in this case. Well, maybe not totally.